Are you looking for cheap stock photos to be edited in your Photoshop application? Search no more! 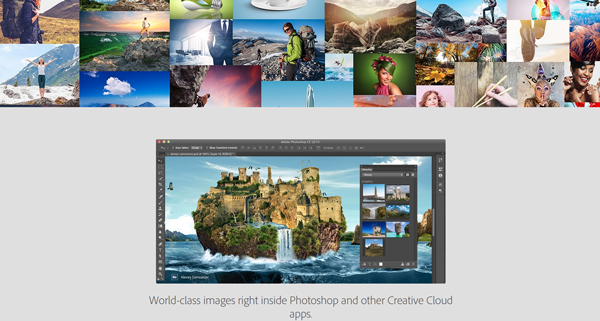 The new Adobe Stock photography is available for both Creative Cloud users and non-users. Although, a member enjoys discounted subscription plans. Nevertheless, it is still a great website to download stock photos for your blogs, website, school projects and other creative needs. Adobe Stock photos are over 40 million as of today, giving you a variety to choose from. Curated by Adobe, these royalty-free and high quality photos, graphics and illustrations are available for download through pay per image and subscription plans. Members of Creative Cloud are given 40% discount when they purchase photos. Non-members are also given purchase choices that meet their own needs. With the flood of praises from both Creative Cloud members and non-members, we could not see any disadvantages with the new stock photo website. Members already know how great this photo agency is, but for other creative minds out there, here are some reasons why you should choose Adobe Stock as your new source of high-quality images, illustrations and graphics. Adobe Stock is integrated with Creative Cloud applications, making it easier for Photoshop, InDesign and Illustrator users to download photos. Downloads do not need to be stored in the computer as they are directly stored in the application’s library for easy access. When you need to edit an image from the website, you can use your magic touch instantly. The website is simple but classy. You do not need a manual to figure out how to find the right images for your creative projects. You can find the perfect photo or graphic for your next project without spending too much time searching for your desired image. Best Value. Adobe Stock photo prices are reasonable. You can get a single image for as low as $9.99. If you are not a Creative Cloud Member, you can still enjoy the images for a higher price. On the other hand, members are entitled to 40% discount when they add the stock image plan to their existing Creative Cloud subscriptions. With Adobe Stock, you can purchase, access and edit your images directly from InDesign, Illustrator, Photoshop and other Adobe CC Desktop Apps. You can easily find the image you are looking for through its simple website design. You do not need to spend hours just to find the perfect photo that describes your core message. It is easier on the pocket, too. Creative Cloud member are thankful for the exclusive discount as well. Moreover, they get to save storage space in their computers since it is integrated with CC. With Adobe Stock, photo-editing has never been easier. In fact, it has never been more fun.